Students enrolled at Aspiring Heights Academy are eligible to take elementary level courses under the FLVS Flex Elementary program (grades K–5) and middle and high school level courses under the FLVS Flex program (grades 6–12). Elementary students may take middle school level courses, and middle school students may take high school level courses if the courses are verified as appropriate. We are required to verify that courses are appropriate for a student based on his or her academic history, age, and grade level and that any applicable prerequisites have been completed. Please read our Florida Virtual School FAQs for registration tips and answers to frequently asked questions. Student or parent starts the sign up process. 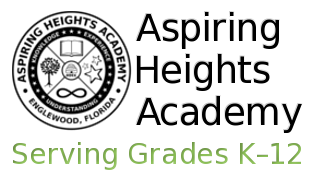 Students with existing FLVS accounts only need to change their physical school to Aspiring Heights Academy. See our FAQs for more information. For FLVS Flex, you will first select Sarasota under Choose a County, and then choose Private School Student under Choose a Student Type. You will later be able to select Aspiring Heights Academy from a drop down list. For FLVS Flex Elementary, you will first select Private School under Select the type of school your child will attend, then select Sarasota County under Select the county your child will reside in, and then select Aspiring Heights Academy under Select the school your child will attend. Student or parent selects courses. Private school students may be enrolled in up to six courses at a time. Selecting both segments in a two segment course counts as one course. When asked whether the course is on your course schedule with your physical school select No, this is not on my class schedule. Student or parent finishes creating an account. This is where FLVS Flex students will select our school from a drop down list. You will also be prompted for the student's address and phone number. Parents set up a separate parent account. Optional under FLVS Flex; automatically created (or updated) under FLVS Flex Elementary. We verify the requested courses. We are required to verify that the selected courses are appropriate based on the student's academic history, age, and grade level, and that any applicable prerequisites have been met. Classrooms are assigned. This can take anywhere from a couple of days to a couple of weeks. Here are a few links you may find helpful both before and after enrollment at FLVS. FLVS Flex Click here to learn more about FLVS Flex. FLVS Elementary Click here to learn about FLVS Elementary options. Sample Course Progression Recommendations Look here to find out which courses students typically take. Parent/Guardian Account Create an account here to monitor your child's account and courses. End-of-Course Assessments Look here for testing dates and FLVS resources. Transcript Request Click here to request an official FLVS transcript. Private school students are not required to take EOC assessments, however they may take them, if desired. Please read End-of-Course (EOC) Assessments for more information. Public school students are required to pass EOC assessments in order to earn course credit and meet public high school graduation requirements. If your child may at some point enter or return to a public school, we highly recommend your child takes these tests.